Dan was born October 11, 1774 in Lebanon, Connecticut. He was the youngest of William and Bethia Throop Huntington's eight children. Dan was prepared for college by Master Nathan Tisdale. In 1794, he graduated from Yale, after teaching school for a term in Suffield, Connecticut. He then spent two years as a tutor at Williams College and during the summer of 1796 was licensed to preach by the Berkshire Association of Congregational Ministers. In the fall of that year, he returned to Yale as a tutor and under President Timoty Dwight began working on his Master's degree, which he received in 1797. Dan Huntington was ordained and in 1798, was installed in the Congregational Church of Litchfield. On New Year's Day 1801, Dan was married to Elizabeth Phelps. In Litchfield, they began their large family, which would eventually number eleven children. In 1809, Dan was a candidate for the pastorate in Hadley, but failed through "jealously of the Phelps family influence." Instead, he moved his family to Middletown, where he began preaching at the First Congregational Church. In order to earn extra money, Rev. Huntington opened his house as a boarding school. A minister's salary was not enough to support a family of nine children, however. In 1816, two years after his father-in-law, Charles Phelps' death, Dan gave up his parish and moved his family to Hadley. He there took over management of his wife's family farm at "Forty Acres," where two more children were born. Dan Huntington continued to preach occasionally as a visiting minister. 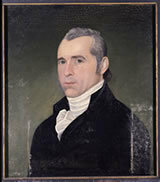 He served as Principal of Hopkins Academy from 1817 to 1820 and was a Trustee of the school until his death in 1864. He was the first postmaster of North Hadley. During the 1820s and 30s, Dan and his wife underwent a conversion to Unitarianism and he was censured by the Hadley Congregational Church in 1835. On October 31, 1864, Dan Huntington died in Hadley. In his 80s Dan Huntington published Memories, Counsels, and Reflections a family history and spiritual autobiography presented in the form of two sermons and commentary addressed to his "Dear Children."